USANA provides the healthy-choice Berry Nutty™ Bar | announced! 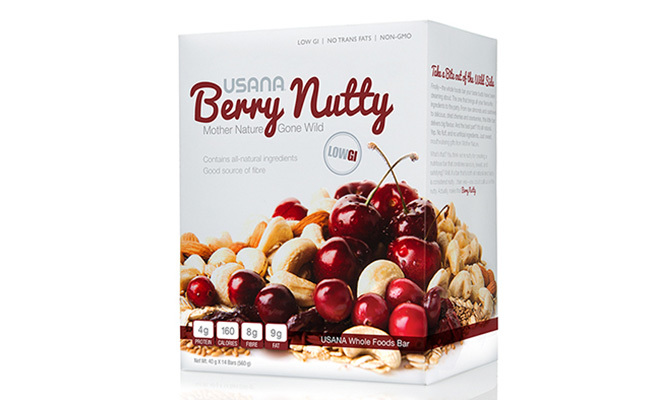 Recently USANA developed the Berry Nutty™ Nutrition Bar that competes with bestselling oatmeal, granola and other healthy bars by offering the item at a competitive price. In 2015 USANA has been recognised as an ABA100 Winner for Best New Product in the Australian Business Awards for the Berry Nutty™ Nutrition Bar. The product is dairy free, soy free, and suitable for vegans as it uses vegan Omega-3 with each bar containing 610mg. The bar is low GI, moderate in carbohydrates and contains completely all natural ingredients. Made up of ingredients loaded with healthy fats including almonds, cashews, coconut oil, sunflower seeds and cracked flaxseed, rich in fibre, and an extremely good choice for a healthy heart. The bar’s primary ingredient are cherries and cranberries, which are labelled as the “new antioxidant superfruit,” full of antioxidants that fight free radical damage and protect the body at cell level. USANA manufactures this product to the same standards and care that it manufactures pharmaceutical products. InfoTrack on track with its Service Excellence. Mercy Health selects only the best.